shaped figure inside and the letters SC in blue inside the red >. 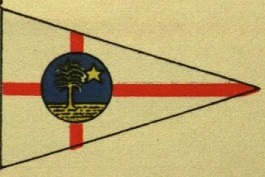 Burgee white: circular badge showing a sandy beach, with a palm tree to the right, and the sun shining down at the left, in the centre of a St George’s cross. High Admiral) , previously Commander-in-Chief of the Home Fleet, and later First Sea Lord. 30 June 1925. The Colonial Office replied that the title ‘royal’ would be arranged, but that application for the ensign should be made to the Admiralty. Although applications for a special ensign by British clubs were often refused on the grounds that the club was, too small, not sufficiently important, or too near another club that had already been awarded a special ensign, applications from overseas clubs were always approved, providing they were supported by the Governor or Governor-General. In this case the Admiralty appear to have had reservations because the majority of the club’s member were American. 31 July 1925. Permission for a Blue Ensign, defaced with the same circular badge as on the burgee, but due to the exceptional circumstances, to be flown on the club-house. However on 12 August a Warrant for a defaced Blue Ensign was issued, with a proviso that it would be reviewed after ten years. Vessels would need to be British registered and the owner a natural born or naturalised British subject. 26 June 1931. Admiralty asked for the return of the warrant. 27 May 1935. Application to renew club’s special ensign. British members now exceed American members. 23 August 1935. Granted for ten years. Review in 1945. Date when current ensign replaced original ensign not known. In 1963 the current burgee is already in Lloyd's - in the American edition. At least, sort of: It's shown with a much simpler crown, which is completely red, making the burgee a bicolour of white and red. In 1960, this is much how the Dumpy Pocket Book of Sailing Dinghies and Yachts pictures it as well. I set out to find some answers, but it looks like I only added more questions. I hope someone else has the answers, then. (b) The Burgee shall be white with a red St. George’s cross defaced bythe badge of the Club. (c) The badge of the Club shall be a royal crown surrounded by a laurel and the words ‘Royal Nassau Sailing Club’. "To me, those description don't combine to say that The Burgee of the club is white red St. George’s cross defaced in its centre by a white disk bearing a gold and red <type> crown, with next to it on the arms, four white capital letters: (clockwise starting hoistward) 'R', 'N', 'C', and 'S'. I didn't see other statutes or bye-laws for the club that might describe the ensign, burgee, and officers flags. Should we consider this a de jure variant of the burgee? I would write the club directly and find out what they know. As far as the current images posted on FOTW, I drew those directly off of a club ensign that they sent to our school while we were in Malaysia. They also sent a photo of the current burgee. Both had fully colored crowns. I can't say whether or not Dumpy, Lloyds or any other publication from the past depicted every burgee they printed exactly as it should have been, or as they were actually being used by their respective yacht clubs. Evidence suggests that said publications were probably very close to accurate all of the time, but not necessarily spot on in every case. This afternoon, a very nice Royal Nassau Sailing Club ensign arrive from Nassau. We found it interesting as its proportions are 2:3. Apparently, the club orders its ensigns from the US instead of having them made in the UK. The defacement in my illustration is placed exactly as it is on the ensign here with the tops of the letters "R" and "C" touching the horizontal center point of the fly. Anyway, since the RNSC's actual usage ensign varies from the standard variety British 1:2 ensign, I thought we might want to post this along with our 1:2 RNSC ensign. One of the non-UK yacht clubs whose members may apply through club secretary to the Second Sea Lord for an individual warrant for a special ensign if they own a British registered yacht is Royal Nassau Sailing Club (Bahamas) - Blue Ensign with club badge. This RNSC ensign was approved by the club's secretary. RNSC's website can be found at <www.rnsc.org>. I thought that I had posted these to FOTW back in 2008 when I sent the other Royal Nassau Sailing Club stuff. I drew these at the club's request, and remember that they sent be art work. That said, I don't have the art work any longer, but remember that the club approved these images as their old burgees. As you drew these for the club, would you happen to know which one is older, or when they were used? I think that upper is the older one. I am not sure when one was dropped and the other one adopted, nor am I sure when the current burgee and ensign defacement was finally adopted. The upper one with the dark blue sky is in the 1928 Flaggenbuch, and thus probably the older.